Dubbed to be one of the top kneeling chairs according to Amazon buyers, the Flash Furniture WL-SB-210-GG Mobile Wooden Ergonomic Kneeling Chair shows great promise for posture improvement. For new users however, this chair might seem difficult to use and out of the ordinary, but studies show that the product is capable of producing back pain relief. First off, the product has more than 400 user reviews, averaging at 4 out of 5 stars which is pretty impressive. Made from wood but with a black fabric covering, this Flash Furniture makes for a very good addition in most homes and offices. It measures 17.5 by 26.5 by 20-24 inches, allowing for multiple users to adjust the product as needed. The most attractive feature of this product is the height adjustment frame, carefully cushioning the lower back to promote proper posture. The lack of arms encourages the user to practice their balance which proves helpful not just while sitting but also while on their feet. This also paves the way for better posture when standing, throwing the shoulders out and straightening the spine, allowing each spinal disc to fall in its proper place. The ultimate result of this posture improvement is pain relief along the shoulders,thighs, lower back, and other body parts inflammed by an incorrect position while sitting. The thick black fabric combined with wonderfully padded seat and knee rest cushions that body parts that takes most of the pressure while sitting. The pads themselves are capable of retaining form even after prolonged use, ensuring that there’s little ‘thinning’ even after years of daily sitting. The height may also be adjusted and according to reviews, even a buyer measuring around 6 feet managed to comfortably sit on the chair without any problem. At the same time, this Flash Furniture is capable of supporting above-average weight, the same buyer being 165 pounds and comfortable using the product. Total weight capacity is around 200 pounds. Dual wheel casters are in place, ensuring safety during use. 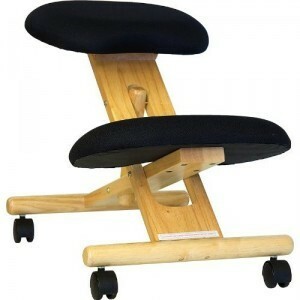 The wheels themselves are made from high quality materials, providing sufficient mobility and support for the user. To top it off, the overall design is that of sleek, finished wood – the fabric is fire-resistant as dictated by industry standards. Beautifully constructed with metal screws to boost durability, the product comes in convenient packaging. The design is impressive in a classical sense with no additional embelishments to make usage difficult. Every part provides a function and with the classic ‘wood on black’ look, the Flash Furniture manages to look at home in any office or home setting. All in all, the Flash Furniture WL-SB-210-GG Mobile Wooden Ergonomic Kneeling Chair in Black Fabric is perfect for people suffering from lower back pain. 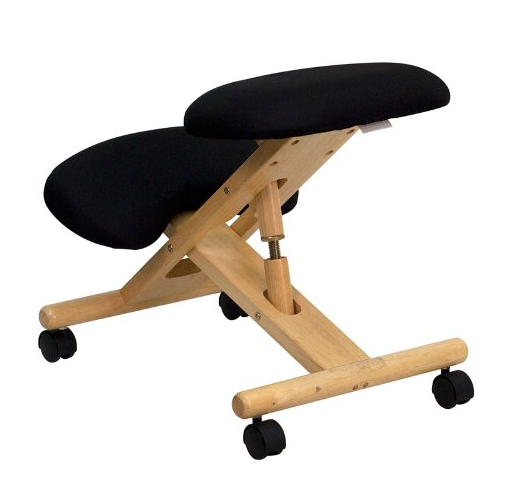 If you are having any sort of problem related to posture, a few days using this chair can subtly correct the problem and slowly alleviate any pain radiating along the back. Combined with maximum comfort provided by the cushion together with a classically stylish design, this product is the perfect choice for many office workers. The price is not bad either and falls within the affordable range.